Seamless gutters are formed on the job to exact measurements. Hidden brackets are mounted inside the gutter for a cleaner look. Protect your home’s foundation from leaks and erosion. Maintain your home’s beauty by protecting landscape. Never needs painting — baked on enamel finish. Most jobs are completed in one day. Our gutter protection system allows rain water to drain into the gutter system without letting leaves, pine needles, and other debris enter and clog the gutter and downspout system. 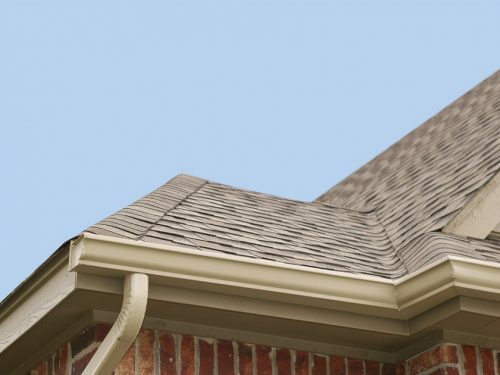 Our gutter protection system adds a true no maintenance addition to your gutter system. LET AN EXTERIOR PRO GUTTER PROTECTION SYSTEM DO THE DIRTY WORK FOR YOU! Low profile installs without penetrating the roof.